Research shows that very soon 95% of what bookkeepers do will be automated. Technology is replacing the bookkeeper. 2. It is more critical than ever before to change our pricing models. This is what you will learn in this book…..
What really drives your profit? – In this chapter, I’ll explain the 4 main drivers of profit and which of them you should focus on. Curiously almost every bookkeeping business focuses on the wrong drivers. Marketing Strategy – What is your marketing strategy? If you don’t have one I break it down into 3 simple steps giving you the clarity you need to grow your business profitably. Pricing Strategy – There are 3 different strategies available. One is difficult to achieve, one is easy and the third is very bad. Most bookkeeping businesses pursue the third strategy. Busting the myths – there are 3 big myths that hold us back. These are limiting beliefs that once banished will give you much more confidence about pricing. The 3 big mistakes – almost every bookkeeper makes these 3 mistakes and they are a big factor in why you work far too hard for far too little money. Once you know what they are you can successfully avoid them. How do you price bookkeeping the right way? – Here I will share with you a proven 7-step formula you can follow to get a better price every time. Your pricing system – Building on the preceding chapter I’ll show you how to systemize your pricing process enabling you to price consistently and with confidence every time. What are the secret strategies the expert pricers use? – How do Apple and Starbucks get away with such high prices? It’s all down to price psychology. In this chapter, I’ll share with you the secrets the most profitable companies use and how you can use them too. What if the books are a complete mess? – One of the hardest areas to price is clean-up work – sorting out the mess before you can take over the bookkeeping. Here I’ll show you how to value price this work. The need for change – Cloud accounting is changing everything. Bookkeepers must add more value to stay relevant. In this part of the book we’ll look at how to turn management reporting into a profitable service. How to differentiate your business – Unfortunately there is a sea of sameness. Most bookkeepers look the same and compete on price. 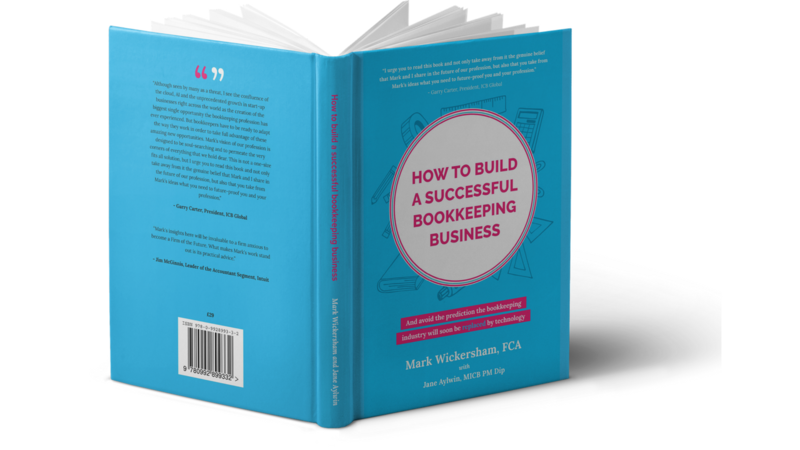 In this chapter, we’ll look at how you can be different, how to use the KLT factor and the 7 ways you can become the ‘Go To’ bookkeeper. Rapid list building – If you want to grow your bookkeeping business you will need a strategy and system for growing your lists. The top marketing methods for bookkeepers – In this chapter, we’ll look at the best ways to get more clients, including the importance of referral systems. You do have referral systems, don’t you? How to price cloud set up – Very soon your clients will no longer have a choice. You will no longer have a choice. Desktop accounting systems will soon be a thing of the past. This is the big opportunity for you. Here we’ll explore how to package, promote and price a highly profitable cloud set up service. Not only is this book highly practical, it is inspiring too. That’s because it is backed up by stories of bookkeepers doing amazing things and getting amazing results. These stories are incredible and show you what is possible when we adopt a better business model. Save up to £5 on the Amazon price and get a digital copy as a bonus for your Kindle.